Keeping the kids happy: foraging with little ones. The school holidays are here and you’re looking for ideas to keep young minds and bodies active and entertained. We have a great suggestion to add to your holiday arsenal: foraging. It comes with the added benefit of having some delicious things to cook and eat. Wild Garlic leaves and buds. What is foraging? Foraging is the act of finding food in the wild. You can head out to a specific foraging location - search for a Woodland Trust forest here - or hunt closer to home in the hedgerows and the paths you walk every day. It’s astonishing what you see when you slow down, whether you’re in a city park or the country lane. New trend? Some think that foraging is no more than a fashionable fad, but we’ve been combing the countryside for food for generations. Didn’t you ever hunt for blackberries as a child? If so, you were foraging. In recent years we’ve perhaps lost touch with our wild food roots, but organisations such as the Woodland Trust, the Forest School Association and even BBC’s Countryfile have raised the profile of foraging of late. How to go about it? Of course, there are guidelines for foraging responsibly and sustainably. We’d suggest you begin by hunting in public places - paths, hedges, public parks and forests. Don’t venture onto private land unless you have the landowner’s permission. Probably the most important point to make is to know what you’re picking. Get yourself a good guide book - we like Hedgerow by John Wright - and check your findings against it fastidiously. Found food can be endangered, inedible or - worst case scenario - poisonous, so never eat your findings unless you’re absolutely certain of what they are. That said, identifying your finds is a huge part of the fun of foraging - in our experience, children love it! Collect only what you’re likely to use in food preparation and cooking, collect from plentiful rather than sparse populations and leave plenty behind for others - we want everyone to be able to share in the fun, after all. Also, be careful not to uproot plants carelessly or trample over other shrubs to reach your foraging goal. We’re big believers that foraging is a great way to start an ongoing conversation with children about sustainability and caring for the environment. What can I find at this time of year? 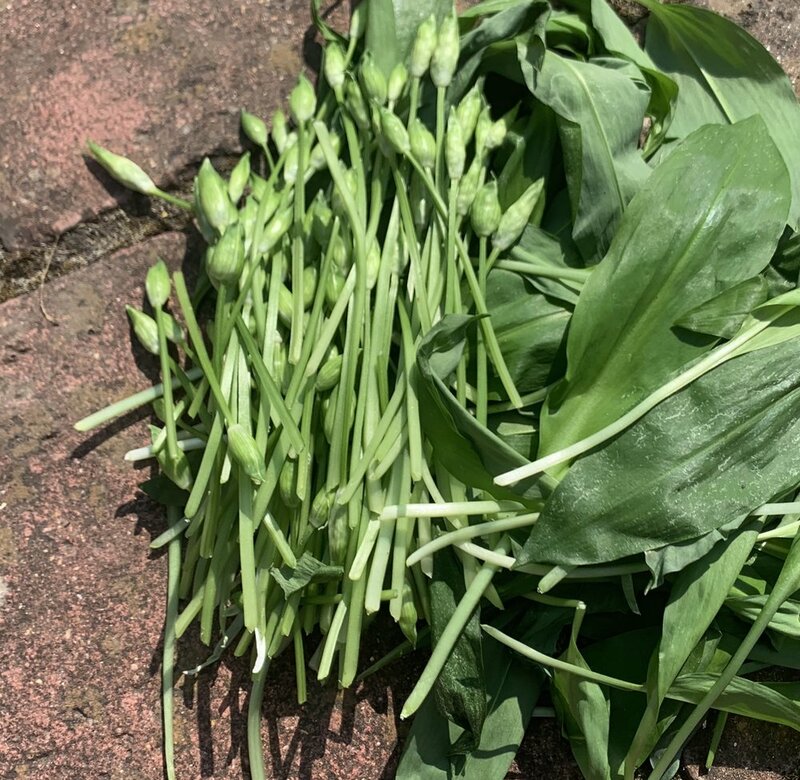 If you’re heading out in the Easter holidays, keep your eyes peeled for garlic mustard and, my favourite, wild garlic - we’ll be following up with some wild garlic-inspired recipes shortly! Heading into May, you might be fortunate enough to find sorrel, chickweed and lime. And if you’re planning ahead for the summer or autumn, Countryfile magazine have a useful month-by-month foraging guide here. Rosemary growing on the lane. Have you tried foraging with little ones? We’d love to see your finds - tag @BritHerbKitchen or #BritHerbKitchen to share your posts with us!